Mother Satuyok’s Child of Alaska Makawi SE38480/2016) Health results: HD:A, ED:O, Eyes clear and PN free by her parents. Working results: Many mid distance tours at Laplands Wolftrail, tourist safaris during winters 2015/2016 and 2016/2017. 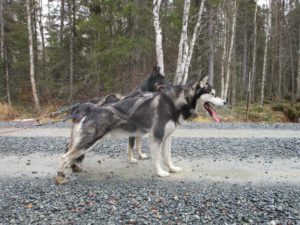 Very good trotter, moderate drive, wheel dog, very nice temperament toward people and male dogs, can be sharp/tough toward some other females. Sizes: 60 cm tall, 28 kg. Father Joki (‘Back to work’ Hjoki SE43700/2014). Health results: HD:A, ED:O, Eyes clear. PN: free. Working results: Command leaddog during races: Eastpoint open 200 km 2014 and eastpoint open 300 km 2015. Many years mid distance tours at Laplands woltrail. 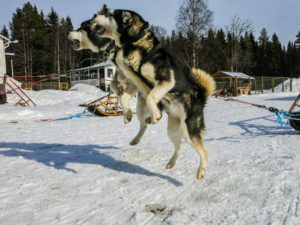 Very good trotter, strong galop, high working drive, very nice and non agressive temperament toward people and all dogs both females and males. Sizes: 63 cm, 35-38 kg. We expect to get offsprings with good drive, excellent trotters and good temperament. 1 males and 2 females stay at our kennel. 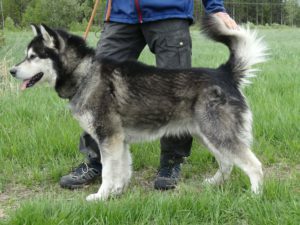 All others found a home at other Alaskan Malamute kennels and/or mushers and other active home around Europe. Health results, working results and eventually show results will follow as soon as they appear. BtW Black Wolf Akka: Callname Miki. HD:A, ED:0, eyes clear, PN non carrier (free by parents), excellent overall health. 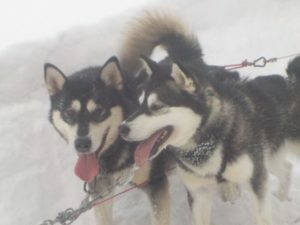 -Many mid distance tourist tours as leaddog at Laplands Wolftrail in season 2017-2018.